A network overhaul undertaken by Frontier Airlines in 2011 that entailed significant pull-downs in Kansas City and Milwaukee in favour of new point-to-point markets and a focus in Denver and Colorado Springs appears to be bearing fruit as the carrier in 2Q2012 recorded pre-tax income of USD14 million, reversing a USD33 million pre-tax posted in the prior year. Much of the improvement can be attributed to the network revamp that served at the centre of a restructuring at Frontier that delivered a total of USD136 million in cost improvements. Frontier parent Republic Airways Holdings estimates that network and fleet changes represented USD50 million in the cost improvement programme as both unprofitable markets and aircraft were eliminated from Frontier’s operations. Between 3Q2010 and 3Q2012 the relevance of Milwaukee and Kansas City in Frontier’s network dropped markedly. During 3Q2010 Milwaukee and Kansas City accounted for 16% and 5%, respectively, of Frontier’s capacity. By 3Q2012 Milwaukee represented just 1% of the carrier’s available seat miles while Kansas City dropped 3 ppts to 2%. During that two-year period Frontier also reduced smaller-gauge aircraft in its fleet, increasing the percentage of its fleet represented by larger-capacity A320 aircraft. In May-2012 the carrier completed a reconfiguration project on those jets that entailed expanding the number of seats by six to 168. As Frontier pulled down the Milwaukee and Kansas City hubs it inherited through Republic’s 2009 purchase of Midwest Airlines, the carrier adopted a point-to-point strategy to focus on routes where it concluded a competitive advantage could be gained. Frontier took advantage of some opportunities created by Southwest’s decision in 2011 to end service to smaller markets operated by AirTran, which was acquired by Southwest in May-2011. During May-2012 Frontier inaugurated service from Orlando, Florida to Harrisburg and Allentown, Pennsylvania and Bloomington, Illinois. All of the markets were previously operated by AirTran. During that time Frontier also started service from its Denver hub to Harrisburg and Bloomington. Frontier’s network revamp also included a renewed push from its Denver hub, where its brand resonates solidly with the metro area’s residents. In May-2012 the carrier launched service from Denver to Bismarck, North Dakota and Bellingham, Washington, which is 133km away from Seattle. During 4Q2012 Frontier is resuming service from Denver to Fargo, North Dakota, a route it previously operated with Bombardier Q400 turboprops, and plans to start service from Denver to South Bend, Indiana. 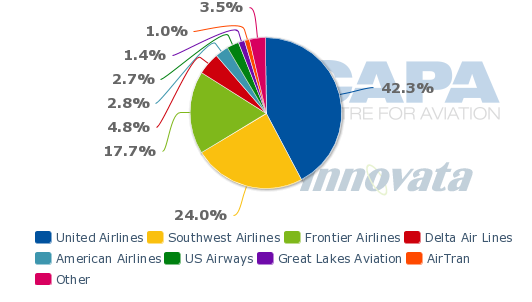 Schedules in Innovata show Frontier competes with United in the Bismarck and Fargo markets. On the Denver-Bismarck pairing, United offers daily service with smaller regional jets while Frontier operates four weekly flights with 100-seat Embraer E190s. United has a somewhat similar service pattern in Fargo, while Frontier when it launches service in the market during Nov-2012 is offering three weekly flights operated with 138-seat A319 narrowbodies. Frontier is benefitting from the competition situation in Denver remaining “calm”, remarked carrier senior vice commercial Daniel Shurz in a recent discussion with analysts and investors. The airline expects total capacity in the Denver market to increase 1%-2% during 3Q2012 and 1%-3% in 4Q2012. Frontier and United have long co-existed in Denver as each carrier retains a hub at the airport. Frontier’s strategy in Denver through the recent network restructuring appears constructed to avoid direct competition with Southwest Airlines, which entered the Denver market in 2006 and now is the second largest carrier in terms of seating capacity at the airport behind United. Frontier is planning further expansion from Orlando in Nov-2012 with the launch of flights to Trenton, New Jersey and Greensboro, North Carolina. Similar to the markets Frontier launched earlier this year from Orlando that were abandoned by AirTran, no competition exists in the new markets from Orlando International Airport. Leisure carrier Allegiant Air operates flights from Orlando Sanford Airport to both Allentown and Greensboro. With four weekly flights from Sanford to Allentown, Allegiant is offering more flights than the three weekly flights being operated by Frontier. Allegiant’s model is built on low-frequency flights from major US leisure destinations to smaller cities, and Frontier seems to be adopting part of that strategy in its new service from Orlando. With the inauguration of two new weekly flights from Orlando to Trenton Mercer Airport in Nov-2012, Frontier joins small carrier Streamline Airways as the second commercial carrier serving the facility. Other carriers have served Trenton in the past including Shuttle America and Boston-Maine Airways, according to the New Jersey News. Trenton is the capital of New Jersey state and is near Princeton University. Frontier aims to be attempting to attract customers that prefer direct flights rather than driving 57km to Philadelphia or 70km to Newark. In announcing its new flights, Frontier stated passengers would gain non-stop flights to Orlando in lieu of service to two congested high-fare hubs. Schedules in Innovata show US Airways, AirTran and Southwest offers flights from Philadelphia to Orlando, while both United and JetBlue operate service from Newark to Orlando. Frontier during 2012 has also made a push from Colorado Springs, which is approximately 109km south of the carrier’s Denver hub. In May-2012 the carrier introduced flights to Phoenix, Portland, Seattle and Los Angeles. In Nov-2012 the airline is adding new service to San Diego and Orlando from its Colorado Springs focus city. At the time it rolled-out the first batch of new service from Colorado Springs, Frontier management told The Colorado Springs Gazette the market was a test of its strategy of launching non-stop flights from smaller focus cities. Allegiant, American, Delta, Frontier and United all serve Colorado Springs, but the legacy airlines serving the airport use the market as a spoke for their hubs, and Allegiant operates service to its larger bases in Phoenix Mesa and Las Vegas. Frontier only has competition in one of its markets from Colorado Springs – Los Angeles – which is also served by United. Frontier’s recent push from the airport has resulted in the carrier quickly becoming the third largest airline in the Colorado Springs market in terms of seat share, which will grow once the new flights to Orlando and San Diego commence. Frontier is also making an interesting move in the Phoenix market, joining low-cost carriers Allegiant and Spirit in operating from Phoenix Mesa Airport, which is approximately 48km southeast of Phoenix Sky Harbor International Airport. Frontier is launching daily Phoenix Mesa-Denver service in Nov-2012, joining its existing service from Denver to Sky Harbor. Frontier also serves Colorado Springs from Sky Harbor. The carrier could be testing the focus city concept at Phoenix Mesa, or evaluating moving its Phoenix operations to a lower-cost airport. Rounding out Frontier’s new service roll-out during 4Q2012 is new point-to-point service from Durango in southwestern Colorado to Las Vegas in Oct-2012. The carrier currently only offers flights from Durango to its Denver hub. Its new flights to Las Vegas could be another test case for a potential build-up in Durango, which currently only has service operated by US Airways to its Phoenix hub, American to its Dallas/Fort Worth gateway, and United to its Denver hub. While the new markets introduced by Frontier are still maturing, the network adjustments did help the carrier grow its revenues 11% year-over-year during 2Q2012 to USD371 million while its total unit revenues grew 8%. Similar to sentiments expressed by other airlines Frontier concludes year-over-year comparisons for 3Q2012 become more difficult as carriers enjoyed a FAA tax holiday in 3Q2011 during a shutdown of the agency’s administrative functions. During 3Q2012 Frontier will also start lapping some of the improvements from its cost improvement programme instituted in 2011. Frontier expects unit revenue growth of 5%-7% year-over-year during 3Q2012 on 4% less capacity. 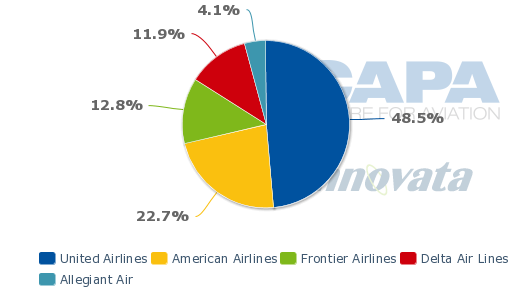 Frontier’s strong revenue performance during 2Q2012 occurs as the efforts by Republic to sale or spin-off the carrier ramp up. Previously Republic has stated Frontier’s marketing materials should be available by the end of Aug-2012, and a transaction should be completed during 1H2013. The carrier’s restructuring efforts during the last year have resulted in steady improvements in Frontier’s fortunes, but it is possible that would-be buyers will be cautious, and wait to ensure the airline’s turnaround is sustainable.